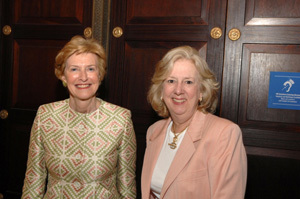 Nancy Newcomb and Linda Fairstein. New York, NY, - C A spring tradition of the New-York Historical Society, first celebrated in 1856 with a picnic in Washington Square Park, the annual Strawberry Festival will take place this year on Monday, May 18, at the Society’s landmark building at 170 Central Park West. U.S. Senator Kirsten Gillibrand will be the honoree and keynote speaker at the benefit luncheon, which will begin at 12:00 p.m. Senator Gillibrand will take her place as the latest in a line of outstanding women honored at the Strawberry Festival, including her predecessor in the Senate, Hillary Rodham Clinton, who was the keynote speaker in 2005. Other recent honorees include Michelle Obama (2007), Betsy Gotbaum, Nancy Newcomb, Anna Quindlen, Leslie Stahl, Christine Quinn and Wendy Wasserstein. Sworn in as New York's Junior Senator on January 27, 2009, Kirsten Gillibrand previously served in the United States House of Representatives representing New York's 20th Congressional District, which spans ten counties in Upstate New York. Senator Gillibrand serves on the Environment & Public Works Committee; Foreign Relations Committee; Agriculture Committee; and Special Committee on Aging. Prior to serving in Congress, Senator Gillibrand was Special Counsel to the U.S. Secretary of Housing and Urban Development, Andrew Cuomo, during the administration of President Clinton. At HUD, Gillibrand played a key role in furthering the Labor and New Markets initiatives, working to strengthen enforcement of the Davis-Bacon Act, and drafting legislation to build infrastructure aimed at revitalizing lower income areas across the nation. Senator Gillibrand lives in Greenport, New York, with her husband Jonathan Gillibrand and their sons Theodore, who is 5 years old, and Henry, who was born in May 2008. Senator Gillibrand is the sixth woman to have given birth while serving as a Member of Congress. Proceeds from the Strawberry Festival support the major exhibitions and educational programs of the New-York Historical Society. Current and upcoming N-YHS exhibitions include Abraham Lincoln In His Own Words: An Intimate View of Our Greatest President; Harlem 1970-2009: Photographs by Camilo José Vergara; Landmarks of New York; New York Painting Begins: Eighteenth-Century Portraits; and this fall’s Lincoln and New York. Tiffany & Co. will present an array of jewelry at the 2009 Strawberry Festival luncheon. Included are jewels inspired by the legendary creations of Louis Comfort Tiffany and other historic designs from the Tiffany & Co. Archives, as well as iconic jewelry by world-renowned Tiffany designers Jean Schlumberger, Elsa Peretti, Paloma Picassso and Frank Gehry. Claudia Cogan, Tiffany gemologist and custom design expert, will be on hand to answer any questions. Strawberry Festival tickets are $300, $600, and $1,000. Media RSVP is required. The New-York Historical Society, one of America’s pre-eminent cultural institutions, is dedicated to fostering research and presenting exhibitions and public programs that reveal the dynamism of history and its influence on the world of today. Founded in 1804, the Society has a mission to explore the richly layered history of New York City and State and the country, and to serve as a national forum for the discussion of issues surrounding the making and meaning of history. The Society is recognized for engaging the public with deeply researched and far-ranging exhibitions, such as Alexander Hamilton: The Man Who Made Modern America; Slavery in New York; Drawn by New York: Six Centuries of Watercolors and Drawings at the New-York Historical Society; Grant and Lee in War and Peace; and the 2009 exhibition Lincoln and New York. Supporting these exhibitions and related education programs is one of the world’s greatest collections of historical artifacts, works of American art, and other materials documenting the history of the United States and New York.